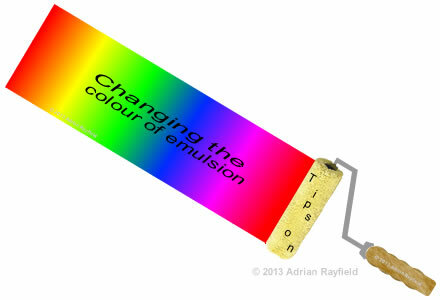 From time to time you may wish to change the colour of the emulsion on your walls, this is normally a straight forward job, however, if you are changing the colour of the emulsion there are things to consider. We all get bored with the same colour on our walls, sometimes we make a mistake a pick the wrong colour just because it is in fashion or ‘on trend’ but when we get it on the walls we don’t like it or maybe it doesn’t really go with the sofa or carpet. Sometimes the colour doesn’t look exactly the same as it it on the sample card so you want to change it. Or perhaps the walls have just got dirty. Whatever the reason for changing the wall colours depending on what colour they are now will depend on how you re-paint them now. If you are painting over a weak or light colour, say a cream or white, and you are going to paint with a strong or dark colour such as red or dark green then this shouldn’t be too much of a problem, you will naturally need to fill any holes and cracks and rub them down smooth and level and prepare the walls as normal. To paint the wall you will need two coats, this means two coats of cutting in and two coats emulsion on the main part of the wall. If you are painting over strong or dark colours such as blue or red then you will find it easier to apply a obliterating coat first, a matt white emulsion is the best job for this. Matt emulsion is better than say silk emulsion for coverage, but if you have some lying around you could use it but make sure you let it dry between coats and be aware it could slightly increase drying times with the new emulsion as the vinyl in it will ‘hold it back’. You may need to apply two or three good coats of white emulsion to obliterate strong or dark colours and give yourself a good base to work on. You should prepare the walls as you normally would, fill cracks and holes and sand them down smooth and level and then apply the matt white emulsion to obliterate the strong or dark colour, leaving each coat to dry fully in between. Then once the obliterating coat is done you can apply two good coats of final emulsion colour. You could give the walls a light rub down to remove and rough areas or debris before apply the final emulsion colour. I have been asked in the past if you need to undercoat the walls first, on this occasion it was because the white wall were a bit grimy and dirty, I replied saying, “No, you don’t need to. A wipe over with sugar soap or warm water and washing up liquid would suffice”. Which is what I did before painting the walls a cream colour. To work out how much paint you need to buy, you need to do some quick measurements, so you will need a tape measure, and a pen and paper. You need to know the wall or walls width, the hight of the room and how many coats you plan to do (2 is recommended for emulsion), also you need to know how far a litre of paint goes, you can find this out either on the tin of paint, in the paint manufactures literature or from the paint supplier. Once you have these simple measurements and figures head over and use this great paint calculator and input your figures to find out how many litres of paint you are going to need, you can also use this calculator to work out how many litres of matt white emulsion you need to block out a strong colour. Please feel free to leave a comment below, also consider sharing this post and our site with your friends on Facebook, twitter, Google+ and any other social media you may use. If you wish to paint an entire room, a feature wall, a ceiling or just trim such as skirting boards and architraves you will need to know how much paint to buy, now you can guess but wouldn’t it better to have a more accurate quantity so you don’t over buy? Paint can be expensive, especially specialised paints so knowing how much paint to buy is a good thing. To measure for painting all the walls in a room, you should measure each wall’s width and make a note of each width, for a typical room with four walls you would measure as so 3.6m, 2.9m, 3.6m, 2.9m, you would then add these figures together, so for this example 13 metres. Make a note of this on your notepad. If you are only going to paint one wall as a feature wall you would only measure the width of this one wall and make a note of the width. Now you need to know the height of the wall or walls you are going to paint, a typical room maybe 2.4m high. If you are only painting above a dado or picture rail you would only need the height from the dado to ceiling or dado to floor. Next, what you need now is to know how many coats of paint you are going to apply, emulsions, masonry paints etc should have 2 coats normally, undercoats and topcoat normally only need one coat of each, you should check with the manufacturers website or on the tin of paint as for how many coats are required. Note this down. Finally how many squared metres do the manufactures say a litre of the paint will cover, if for example the can or website says a five litre tin of paint covers 65 square metres then divide this by 5 and this will give you a figure of 13. Write this figure down. 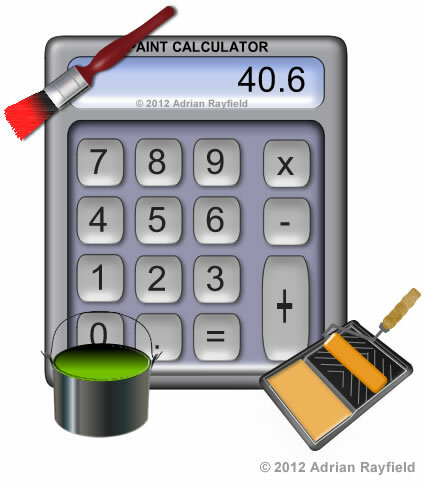 Use this great free paint calculator, input the four figures written down, hit the calculate button and the calculator will give you the results of how many litres of paint to buy. For our example, painting all four walls with emulsion. The walls measure 13 metres and the height of the walls are 2.4 metres, giving the walls 2 coats of emulsion that covers 13M² per litre returns a result of 4.8 litres, now as you can’t buy 4.8 litres I would buy a 5 litre tin. If I wanted to calculate how much paint I need to paint a ceiling, I can still do this by measuring the length and width of a room, one figure would be the width and the other the height then decide on how many coats and look up how many square metres one litre covers. Input these into the paint coverage calculator to get the result. Watch this short video to see just how easy this paint calculator is to use. To calculate how much paint you need for a feature wall is simple, measure the width, height and put these figures as well as number of coats and coverage per litre to get the result. Trim such as skirting boards, architraves can also be included and can be calculated using this paint calculator, again work out the width, for skirting his would be linear metres and height would be the hight of the skirting say 4 inches / 100mm which is 0.1000 metres. Again include number of coats and and coverage of paint per square metre. So using our example room from before, the width of all skirting would be 13m (same as walls) and the height of the skirting is 0.1000 (4 inch/100mm), as I’m using satinwood I will do 1 coat and coverage per litre is 15M². So I need 0.1 litres, so I would buy one litre of satinwood, but I would be using this for the other woodwork such as doors, windows etc. so not going to waste!